Davis, CA (November 10, 2018)—The 32nd annual U.S. Bicycling Hall of Fame inductions unfolded against a background of California wildfires. As Jerry Ash, the 1973 match sprint track champion and winner from 1977 to 1979 of the muscle-searing kilometer time trial, was driving away from his house in Malibu to make his way to inductions ceremony, the car he was riding in dashed between flames incinerating both sides of the road. Among career possessions was a silver medal scored at the 1978 Munich Worlds when Ash paired with 2016 Hall of Famer Leigh Barczewski in the tandem sprints. Ash, nicknamed The Gentle Giant for his height and personality, was honored as a Veteran Road & Track Competitor. Another track sprinter, Jennie Reed, was voted in as Modern Road & Track Competitor. In her teens she won both the match sprint and individual pursuit titles at USA Cycling Juniors Track National Championships. She was a freshman at the University of Washington when she received a telephone call from USAC sprint and kilo coach Andrzej Bek. She dropped out of college and fulfilled her cycling talent. Reed ruled the women’s national track championships from 2005 to 2007, capturing titles in the keirin, team and match sprints, 500-meter time trial, and the team pursuit. At the 2008 Union Cycliste Internationale Worlds in Manchester, England, she won the keirin—the first U.S. woman to win that high-end sprint event. In the 2012 London Olympics she took home a silver medal in the three-woman team pursuit over 3 kilometers. By the time she retired from racing she had won 14 USAC national championships and competed two Olympics and 13 UCI Worlds. 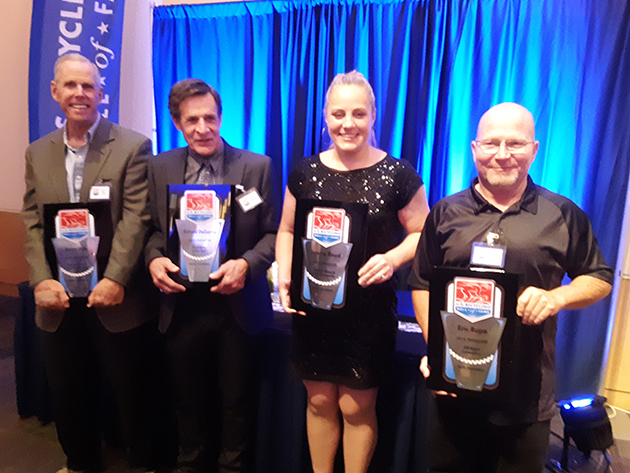 BMX racer Eric Rupe was inducted as Off-Road Competitor, adding to his 1988 induction into the American Bicycle Association BMX Hall of Fame. Nicknamed “Big Daddy,” Rupe has been a champion BMX racer for more than 40 years in ABA, National Bicycle League, U.S. Bicycle Association, and International Bicycle Motocross Federation. Richard DeGarmo, president of the U.S. Cycling Federation (predecessor to USA Cycling) from 1987 to 1993, was inducted as Contributor to the Sport. He helped expand the USCF to include BMX racing. DeGarmo served as road coordinator at the 1986 UCI Worlds in Colorado—America’s first Worlds program in 74 years. DeGarmo played a vital role in getting mountain bike racing as a medal event in the 1996 Olympics. The U.S. Bicycling Hall of Fame has inducted 158 men and women.